I always had a negative outlook on everything. So when people, including S.O.S., would approach me to deliver a positive message, I would shun them. Until I was shot and S.O.S. came to see about me in the hospital. I learned to pay attention to the message. We ask for your support as we continue to spread messages of peace and work to build safer and healthier communities for everyone. You read our blog to stay in the know about our work and hopefully play a part in it too. This is your chance to play that part. Please take a moment to make an end-of-year gift to the Crown Heights Community Mediation Center today or donate an item from our Amazon Wishlist. 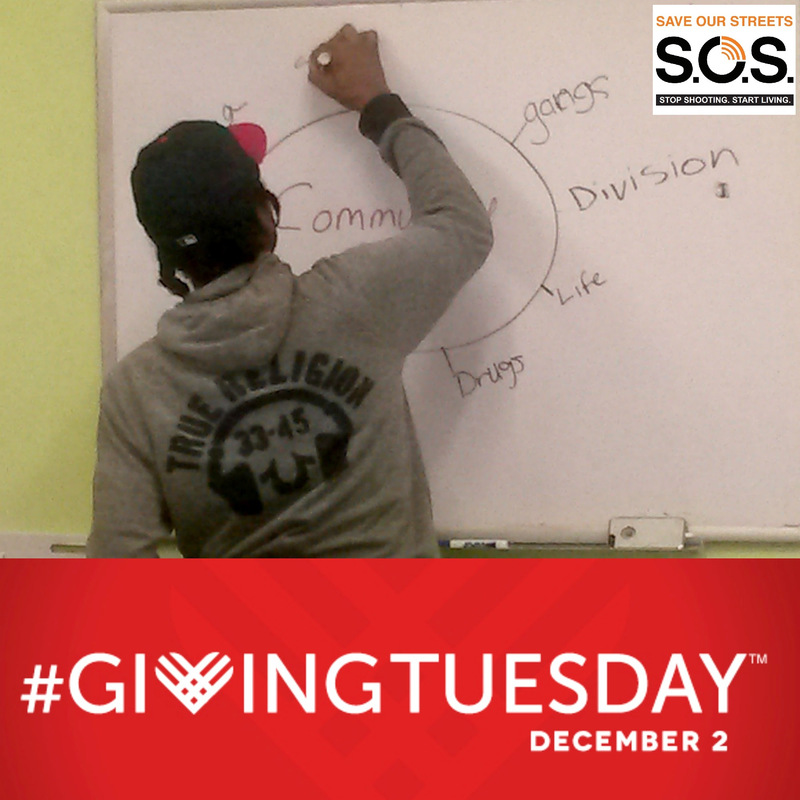 December 2nd marks the third annual #GivingTuesday, a day dedicated to celebrating the causes we care about most. At the Mediation Center, we are proud of the ways in which we've contributed to the cause of anti-violence so far. 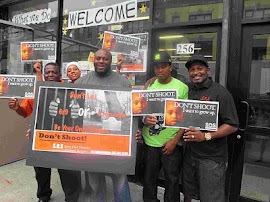 When our street team started working in 2010, there were 24 shootings in the S.O.S. 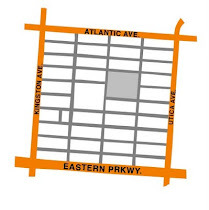 Crown Heights target area. This year, it is down to 9. The Center for Court Innovation's research, completed in 2012, demonstrated that without our program, shootings likely would have increased as they did in similar neighborhoods without the program. We are incredibly grateful for the decrease in gun violence in 2014 and for this expansion in services. We also realize that there is still much more work to do. We envision neighborhoods not only free of shootings, but enriched with resources, community pride, and ample opportunities for individuals to reach their full potential. P.S. To give online, be sure to select the "Crown Heights Community Mediation Center" from the drop down menu. All donors will be automatically entered into a raffle to win a gift card from a local business! If you prefer to give by mail, checks can be made out to our parent organization, the Fund for the City of New York, sent to the Crown Heights Community Mediation Center at 256 Kingston Avenue, Brooklyn, New York 11213. P.P.S. Follow us on Facebook and Instagram for more updates on #GivingTuesday throughout the day, including photos from our #UNselfie #UNdoviolence project! Tuesday evening November 25th, participants from all Mediation Center programs, including S.O.S., YO S.O.S., and Make It Happen gathered to remember our gratitude and feast on pies. Pies were fresh baked by staff and community members and also donated by our neighbors at Fine Fare Supermarket as well as Momofuku Milk Bar in Williamsburg. 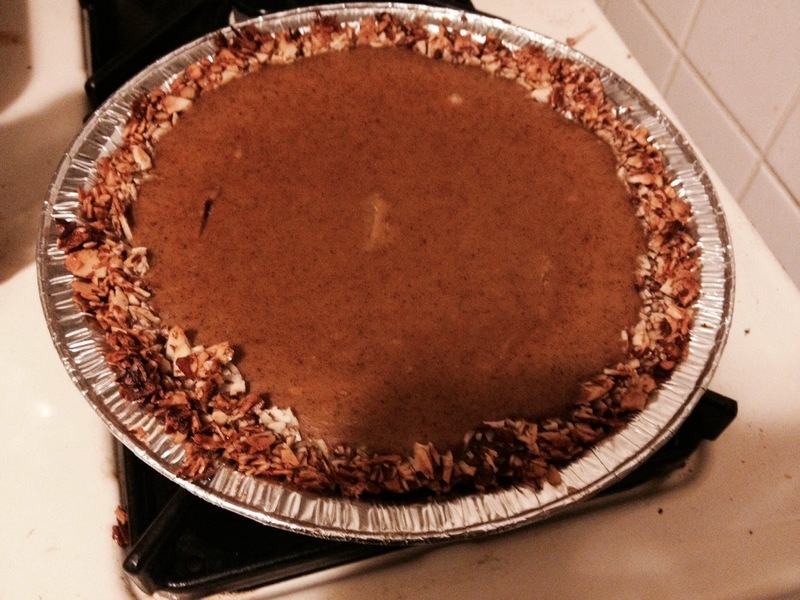 Pies included pumpkin, pecan sweet potato, apple, squash, and coconut. There was also a photo booth staffed by volunteer photographer Brittany Buongiorno with decorations donated by Mimosa Floral Design on Kingston Ave. The interactive photo booth gave community members, volunteers, and staff an opportunity to recall why we stand against violence and what tactics we can use to peacefully resolve interpersonal conflicts. An evening of food, connection, and games helped us remember that we have a lot to be thankful for in Crown Heights! Check out our Facebook next week for photos from the booth! 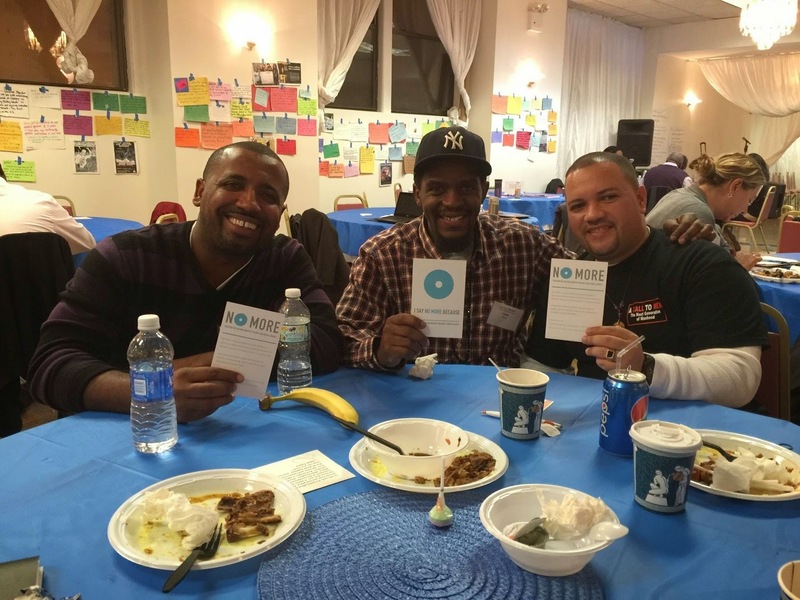 On November 3 – 4 2014, SOS Bed-Stuy and Crown Heights staff attended a professional development opportunity at A Call to Men. The organization, geared toward engaging men and boys in healthy masculinity and challenging sexism, was attended by over 75 participants, mainly men. The conference covered many topics including men’s roles in ending violence against women, positive masculinity, historical context of race in America, and community organizing with men in mind. The S.O.S. members present participated and allowed themselves to be challenged to think outside the traditional male box, in order to avoid unhealthy masculinity and choices for men at the expense of women, girls and other men. On Saturday November 22, 2014 close to 200 community residents turned out to be part of the Thanksgiving dinner at Herbert Von King Park (Tomkins Park). 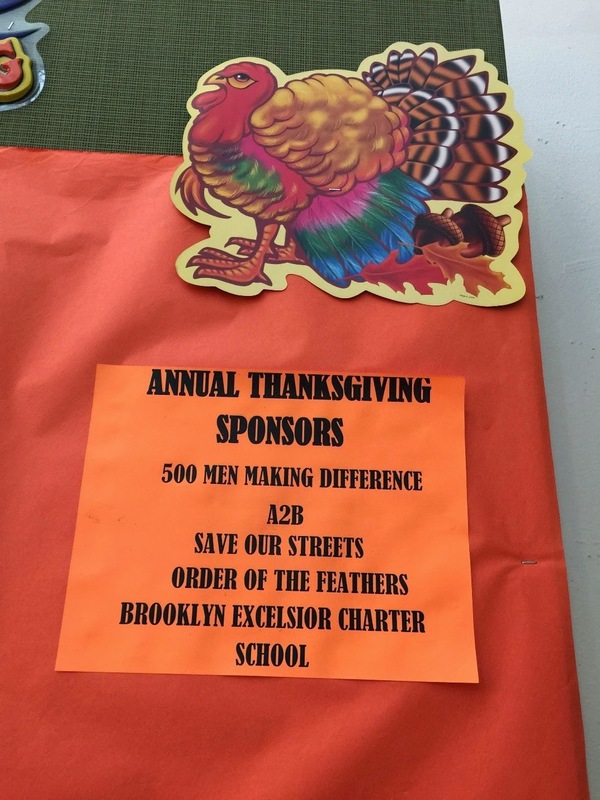 The dinner was sponsored by the Von King Recreation center, 500 Men, Save Our Streets Bed-Stuy, A2B, Order of the Feather and Brooklyn Excelsior Charter School. The S.O.S. 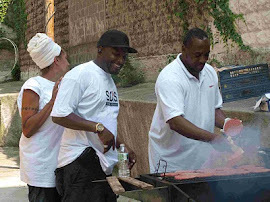 Bed-Stuy team help prepare the center for dinner, assisted in serving food and helped bag canned and other goods for residents to take home. Among the food to take home residents will also find pub-ed material on S.O.S. Bed-Stuy, which was put into every bag. Overall the entire day was a huge success for all organizations involved in the organizing and service. S.O.S. Bed-Stuy was able to generate a buzz among community residents who showed interest in our work and a genuine urge to end the gun violence which plagues our community in Bed-Stuy. The event also helped S.O.S. Bed-Stuy sign up 15 new volunteers all interested in participating in events and shooting responses. Our team as usual shined in the moment as they embraced community members in memorable conversations and expressions of love for the Bed-Stuy community and its future.